The swirling pattern in Naifeh’s Uzbek series is taken from the ceramic decoration in the interior, or intrados, of a dome in an Uzbek monument. In the original, turquoise-glazed tiles spiral from the top of the dome to its base. Naifeh has digitized the pattern, then regularized it, then applied it to modern materials. The computer image is used to laser-cut stainless steel or acrylic and then lit by LED lights. 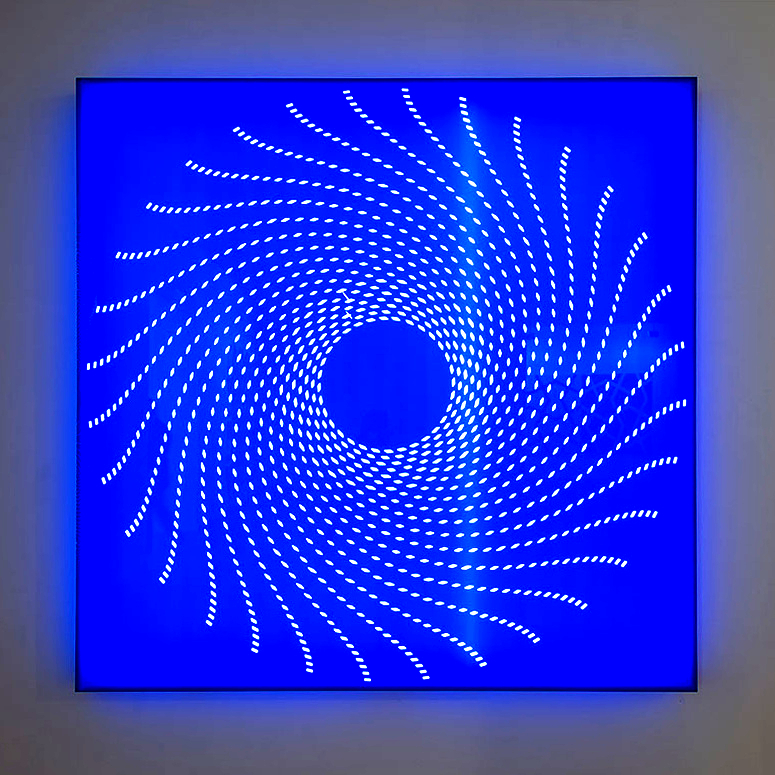 A decorative pattern from half a millennium ago and half a world away creates works that also draw upon the light art and luminist sculptures of the 1960s and 70s. Selected works from the Uzbek series are exhibited below. You can select individual works for an expanded view. For availability and pricing inquiries, please contact us. 2014. Stainless steel with LED lights. 100 x 100 x 3.5 in., 254 x 254 x 9.9 cm. 2013. Acrylic with LED lights. 72 x 72 x 3.5 in., 182.9 x 182.9 x 9.9 cm. 2012. Acrylic with LED lights. 100 x 100 x 3.5 in., 254 x 254 x 9.9 cm.